Though the movie’s original focus was the role of celebrity versus paparazzi and the diminution of privacy their work brings that soon changed. As more and more people noticed Austin he became a celebrity. 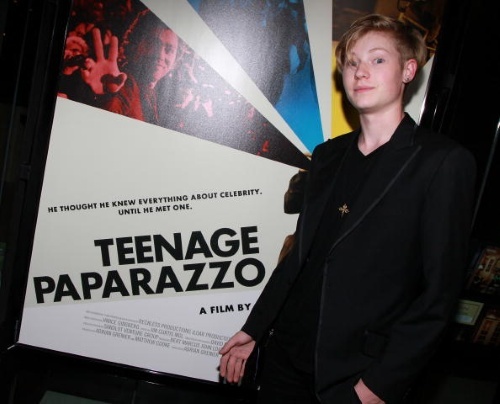 As I clicked through the DVR last night hoping to watch The Daily Show I stumbled across something Helaine recorded on HBO: “Teenage Paparazzo.” I was clueless–never heard of it. As usual the Comcast onscreen guide said little except it was a documentary. That was enough for me. “Entourage” star Adrian Grenier, who is no stranger to paparazzi, was shocked to see a 14-year-old holding his own (and his camera) among veterans more than twice his age. So shocked by the sight of it, he decided to produce a documentary pointed at the paparazzi through his and the teenaged photog’s eyes. The fourteen year old was Austin Visschedyk. Hauling very pricey Canon gear he was wedged in with the grown-up papps when Grenier first spied him. His age and size made him stand out with the celebs and probably helped him greatly as he competed to get salable shots. The movie’s original focus was the role of celebrity versus paparazzi and the diminution of privacy their work brings. That soon changed. As more and more people noticed Austin he too became a celebrity. It was impossible for him to be the person we saw at the doc’s opening. I began to fill sad for Austin. Obviously bright he became jaded and subsumed by the culture he’d been trying to observe. At about an hour and a half Teenage Paparazzo could use a little tightening. It was still compelling especially when its portrayal of Austin turned dark as he and his mom watched their own ugly side in a screening of the nearly finished doc. If you liked Adrian Grenier (Vincent Chase in Entourage) before you’re going to love him now. There’s never a doubt his ultimate loyalty is to Austin who should have been allowed to be a kid. Author Geoff FoxPosted on June 1, 2010 Categories California Spring 2010Tags Pacific Coast Highway, Paparazzi, Zuma8 Comments on Do You Know Anyone In This Photo?